Texas Executive Women celebrates 30 years of honoring the professional and civic achievements of women in the greater Houston community. 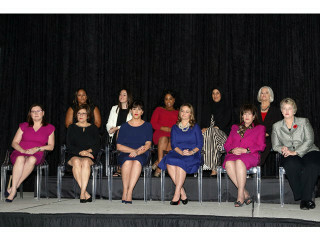 Each year, 10 honorees are selected for the prestigious Women on the Move Award and one young professional woman is selected for the Rising Star Award. The 2015 class will be featured at the annual upscale luncheon at the Hilton Americas-Houston. The event, gathering more than 500 attendees, is the primary funder of the TEW mentorship program which provides high school girls with year-round mentoring and field trips, and college scholarships.